It was an adynaton on many of our minds throughout this year’s election: Donald Trump will take power in the White House when pigs fly. 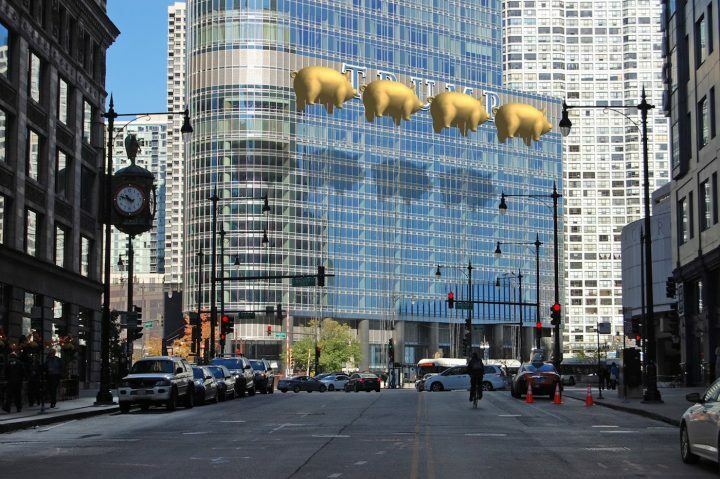 And they’re flying now, in one very worthy proposal by a Chicago architecture firm that visualizes four gilded pigs floating in the air to conceal Trump Tower Chicago’s 20-foot-tall TRUMP sign as a way to “provide visual relief to the citizens of Chicago.” The sign has drawn plenty of backlash since its installation in 2014, seen by critics as an aesthetic assault on the surrounding scenic waterfront view. Pink Floyd fans may have immediately caught the allusion to the band’s famous Animals album cover art, which features a porcine balloon flying among smog spewing from the Battersea Power Station. That album makes for a pretty apt connection to what our future may hold as it is loosely based on George Orwell’s Animal Farm. 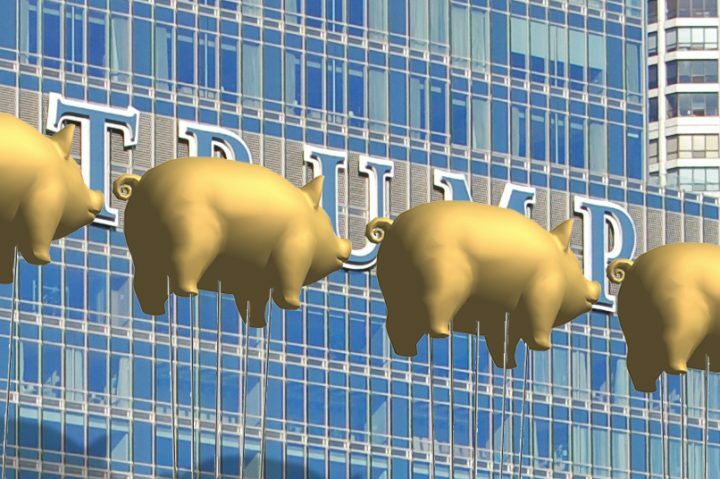 The pigs are also meant to refer to Trump’s outrageous “Miss Piggy” comments, but perhaps more obviously, the bloated swine also resemble gleaming piggy banks. 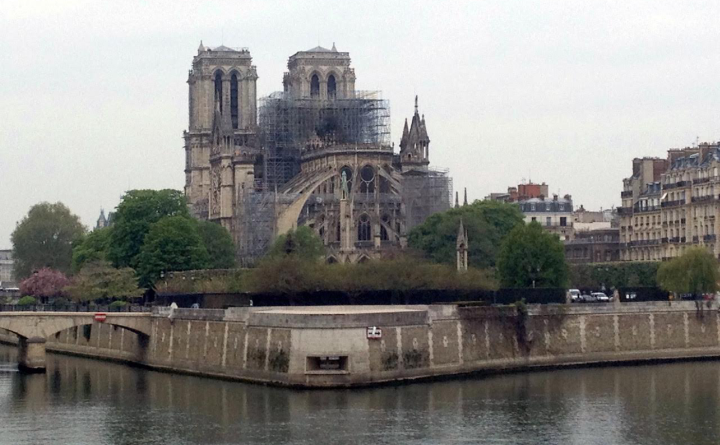 Here, in a foursome — with each one intended to represent “each of the four years the world will need to endure the Trump presidency,” as the architects write — they clearly exude luxury and excess of wealth. 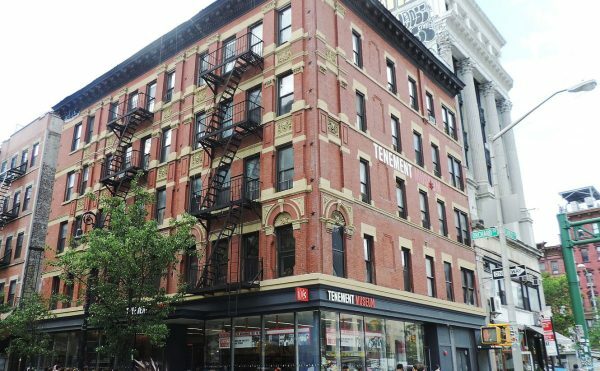 The gold was also the firm’s commentary on the “gaudy style of Mr. Trump’s own gold ensconced penthouse interior he has labeled ‘comfortable modernism. 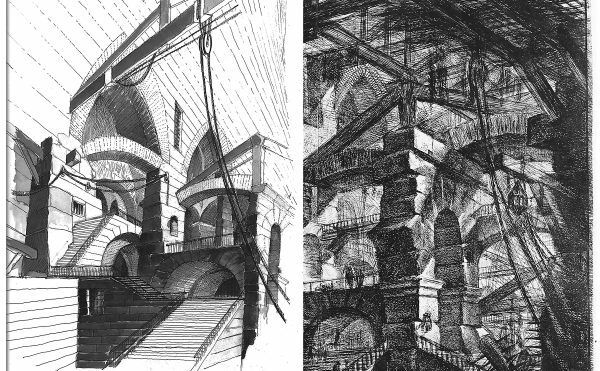 '” And there’s even reason behind the pigs’ direction of flight: they turn eastward to gaze towards Washington, DC. As wondrous a sight it would be to see these pillowy pigs bob serenely in front of those five loud letters, this is still, alas, just a proposal that would be tough to earn a green light and realize. 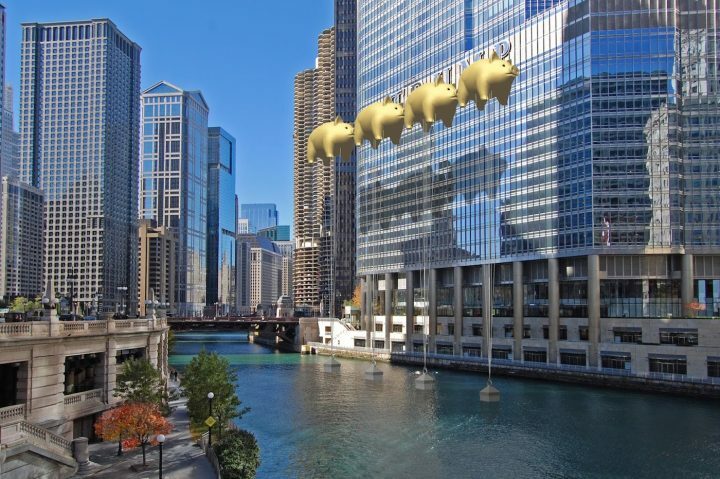 What did come to fruition just last month, though, was another Trump–related artwork of flying pigs: “When Pigs Fly,” painted in Miami by artists Rei Ramirez and Ivan Roque, depicts the president-elect as a winged hog, surrounded by other grinning pigs in flight. 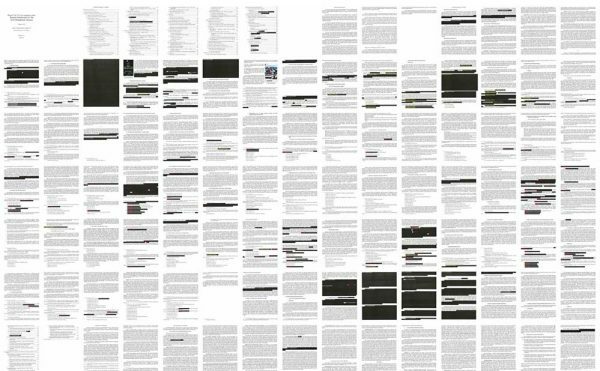 The artists had completed the work prior to the election results; initially inspired by the incredulity of the thought of a Trump presidency, the mural, which will remain on view indefinitely, now seems like a cruel joke. 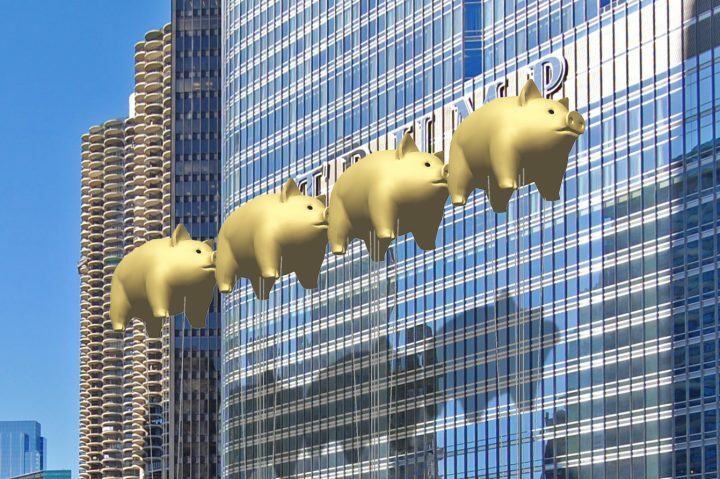 Donald TrumpFlying Pigs on ParadeNew World Design Ltd.